Bring the posh, luxurious side of Reno home with the Stressless Reno (L) recliner. The support and comfort you experience will surpass all your expectations. Smooth leather, soft curves, and padding at every angle offer an urban, high-class feel to the traditional recliner. 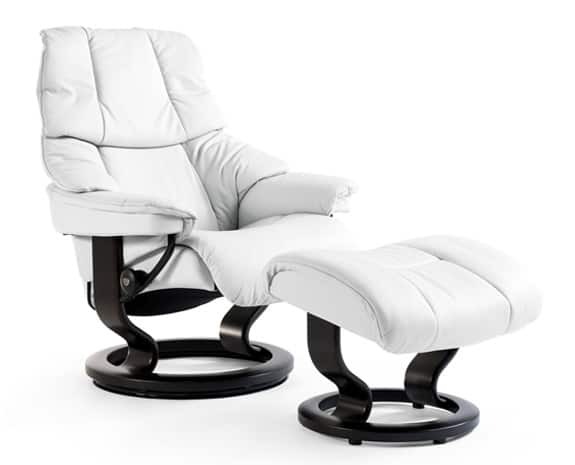 Innovative technology, including the Stressless Plus and Glide systems, offer the perfect balance of ergonomic support as you rest and relax. These systems sense your body’s shape and movement and adjust support as you change positions. From its posh cushioning to its meticulously engineered frame, this chair is built to indulge. Bring the Vegas penthouse suite to your living room with the Stressless Reno (L) recliner. The Reno (L) is perfect for individuals of any size and stature. Release all tension thanks to the Plus system responding to shifts in your weight and supporting the lumbar region of your back. The Glide system moves with your body. You can relax instead of using energy to adjust the chair for the angle you need. The high, padded headrest easily adjusts to accommodate your neck. Relax your entire body with the matching adjustable ottoman to support your legs and feet. Completing the experience, a 360 swivel provides ease of movement. Tap into true luxury at every angle thanks to the Reno (L) recliner. Allow the posh cushions to cradle and support your body while relaxing with a good book or watching TV. The Reno (L) is sure to satisfy your deepest need for peace and comfort. We ship to any address in all 50 United States. Ask for details regarding shipments to Canada. For quality assurance, all Reno (L) shipments must be insured for accident, loss, or damage. Once your shipment leaves our facility, a tracking number is provided via email. Unless otherwise stated, delivery means “to your door.” Shipments must be signed for by someone over 18 years of age. Chris provided us with an excellent product and his customer service was perfection from beginning to end. He knows his product!